1 of 3 Heat oven to 400 degrees . Place bacon strips on a rimmed baking sheet fitted with a wire rack. Bake bacon at 400 degrees for 20 minutes, until crisp. 2 of 3 Heat grill or grill pan to medium-high heat. Coat grill lightly with nonstick cooking spray. Grill tomato slices 1 to 2 minutes per side, until grill marks appear. Grill romaine leaves 1 minute per side. (If using avocado, grill 2 minutes on cut side, then peel and slice.) Grill bread 30 seconds to 1 minute per side. 3 of 3 Spread 1 tbsp chipotle mayonnaise on 4 of the bread slices. 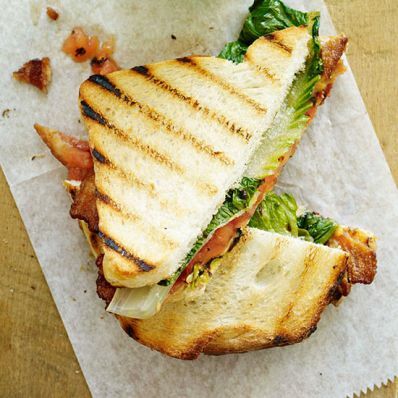 Place 2 bacon slices on top of each, along with a slice of grilled tomato, half a romaine leaf and, if desired, an avocado slice. Top with remaining 4 bread slices.